Well after 8 years of taking people many miles on fishing holidays it was time to treat my girl to some new engines. With nearly 3000 hrs on them and still running very strong signs were there that it was a good time to repower. What did it for me was a good local discount and Yamaha offering a 5 year warranty. I have always liked my cat and with 2 big motors, 2 independent fuel tanks and 4 batteries I have always had faith in the sett up. In all the time I have been running fishing holidays we have only lost one engine a couple of times and always got home on the other one never once having to call out Sea Tow. Well I have stuck with the same motors as they have been so good and for 2012 Yamaha have done a few improvements to an already good engine. The local boatyard did the work whilst I was back in the UK and after last week they are nearly run in the first hour at 2000 rpm was fun I have not been that slow in my boat. All the slow stuff was done on my own with no fishing rods to distract me and no sods law not even a sight of a cruising 50 lb + cobia. Next party are a bunch from Ireland hoping to do what Cian did last year that was a very special week all we need is the weather. What ever the weather ( sorry even I cant change it ) I am sure we will catch fish and the Florida Keys will get under their skins. Well they always say the last day comes just to quick on a fishing holiday but you can smile a bit by booking your next trip as Graham did again at breakfast on his last day. Well it was still blowing but the days forecast was for dropping winds so the plan was just to go north into the wind and try to find some shelter and fish. The ride was fine as the cat just loves a head wing but the water quality was very poor, days of wind had stirred the sea up to a very milky mess. We even went up into the everglades but just the same very poor water and with the wind from the north all night the sea temp had dropped about 6 degrees. Then as if the weather gods said give the boys a break the wind died so off to the grouper wreck we went. Water still not good but fish from the word go jacks and lady fish so fresh bait just what you need here. We always have a heavy ledger rod out here with a live pinfish and it was Graham on the rod which suddenly screamed off. 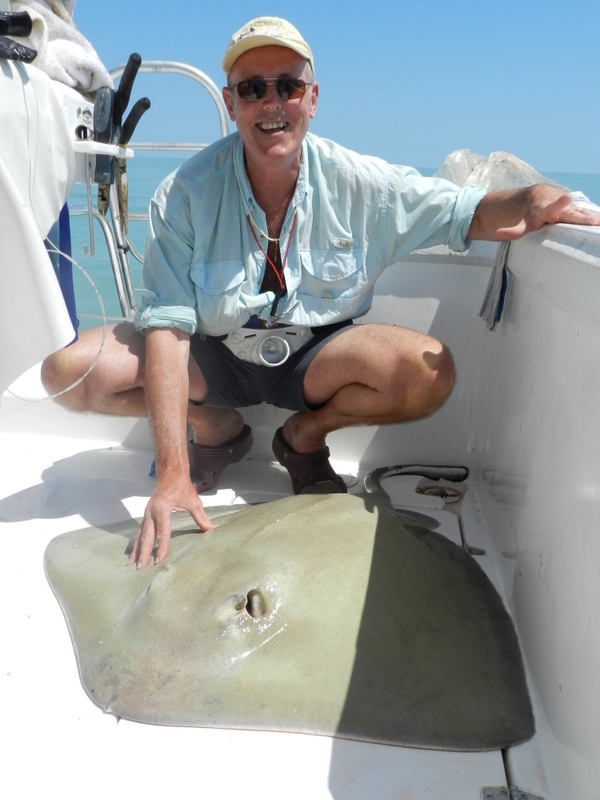 In fact the runs were so fast and long we thought shark but as he did not have wire on the feeling turned to big stingray and we were right what a beauty about 50 lb. With the smiles back on it was Steve’s turn next he was free lining a bait on a light mono rod a good method at this mark then the line started to go uptide and fish on. Well this was a big fish and I have to say Steve did very well and a long hard fight was on even under the rope a few times just to test him out. After a long time and in very murky water we saw the fish a grouper well over 100 lb nice job and a cracking fish to end the week on. Well done boys sorry about the weather you are always a great bunch to fish with and we are already looking forwards to next year. Not only does it rain in the Florida Keys, we had 2.1 in yesterday but it blows as well today the forecast was 25 to 35 mph but at Fish the Dream we have the boat to fish on bad days. So the plan was to tough it out and go down to 7 mile bridge and fish the channels between the flats the cat just powers through the 4 to 5 ft seas. On arrival we only had 1 to 2 seas and soon found fish near the brige piles in fact some of the best snapper we have had this year. 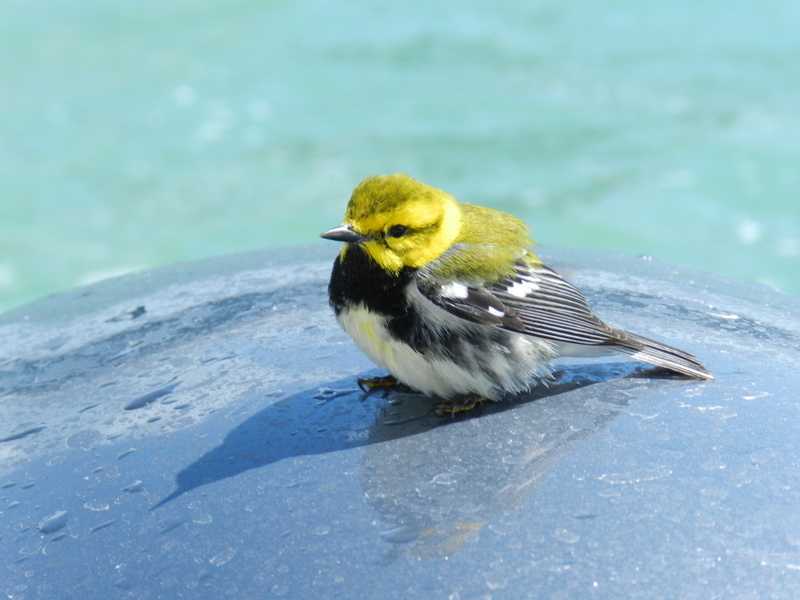 One fun thing happened today a small exhausted warbler stopped on the boat for a rest and first sat on the engine cover then a cool box and after half an hour had gained enough energy to carry on. After fun at the bridge we went to a deep hole near the island which for some reason is the home of bonnethead shark. 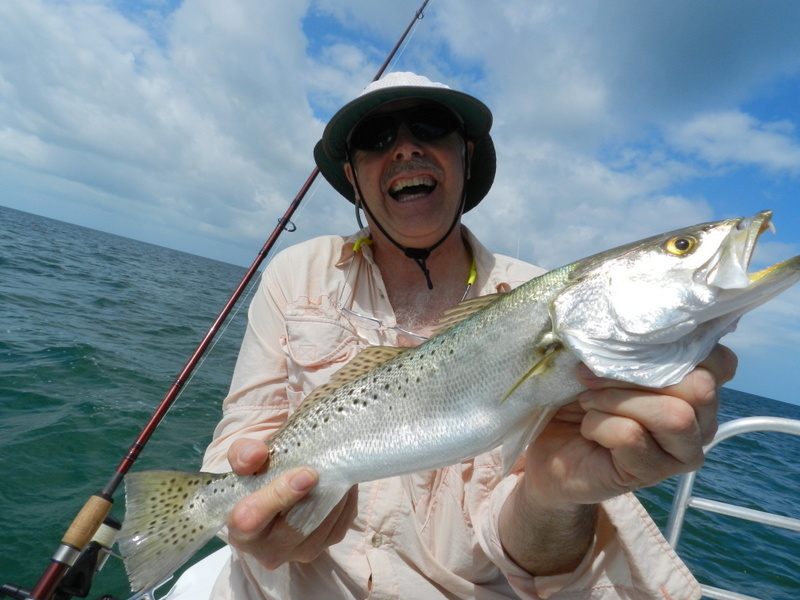 Yet an other fish that pulls well over its weight in the Florida Keys and if you match the hatch fun on a bad day. The fact that on a Sunday we only saw a few other boats and none fishing shows just how good our boat is. I go to most boat shows in Florida and I still have to see a boat that comes close to my Pro Kat so much room and so happy in all seas and it just feels so safe. Many guys on fishing holidays have their own boats and in bad seas like today always say the ride is just amazing, one decision I think I got right, my boat. What I am about to tell you is going turn any lure fisherman very, very green with envy. Yesterday at Bahia Honda in the Florida Keys we found a massive shoal of jack crevalle in one of the most amazing feeding freneze I have ever seen. Hundreds of fish driving bait to the surface then in a top water boil just destroying anything that moved. At the time we had just lost a very big tarpon during the daylight bite when we noticed about half a mile back into the bay feeding fish. 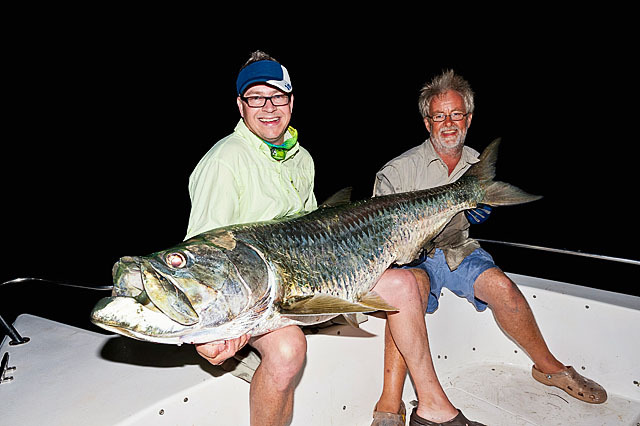 A few years ago while fishing with Henry Gilbey we had had jacks tarpon fishing but this was very different. The fight of any jack is brutal and none of these fish were over 10 lb but they just don’t give up. John was using a Popper and the sight of 50 yes 50 fish chasing, no surfing to get his bait will live with me forever. In fact they were nailing anything and many times it was all four rods at the same time I was just running round the boat unhooking. Fast and furious but what fun a fish a cast just how often does that happen when you are lure fishing. 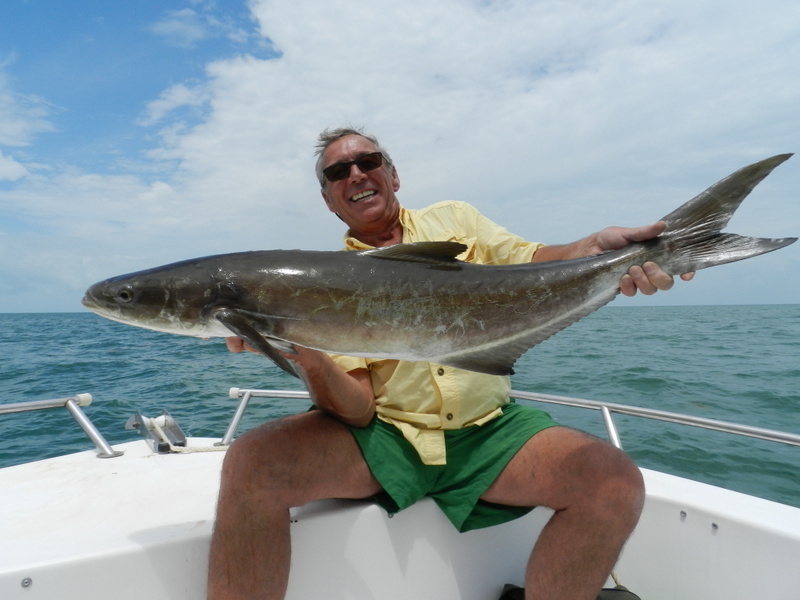 The wrecks in the bay are all holding cobia at the moment and Dave had a nice 20 lb plus fish which we kept and John said it was so good he nearly asked if he could have it for all three courses. When the cobia are on the feed they also go mad and the other day a fish nearly 30 lb came up to the chum bag. Screaming at the anglers, get a bait over here any thing will do two guys got baits near the fish and guess what the cobia ate both of them. 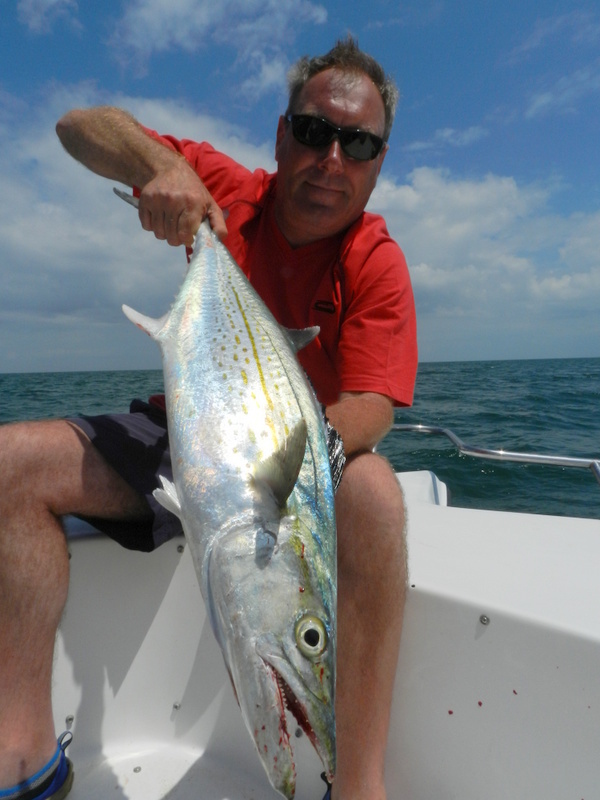 Seeing two anglers fighting the same fish very funny only in the Florida Keys. Back in the sun after two weeks back in Northumberland and yes it did snow and am I glad to be back guess ? First group of this session is Graham and his friends John, Dave and Steve lost count on how many times they have been over. Weather not to bad on the first day so during Helen’s Florida Fry breakfast the plan was a day in the bay and if it was not to bad a wreck or two. First stop general fishing and now with the tight controls trout everywhere fun on light jigging rods wind dropping so of to the first wreck. 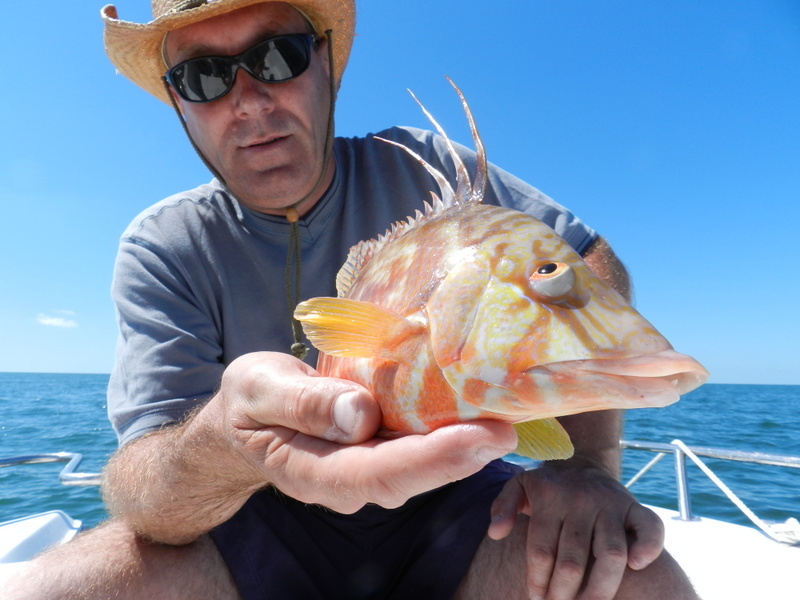 A bit of hassle to get the pick right but it is important, guys out on fishing holidays sometimes seem a bit puzzled by this but having over 12 years experience of fishing in the Florida Keys has taught me to get it right. Soon someone on the light jigging rod was on a cobia fun on just 20 lb braid or what and with this fish there were a whole shoal of others so game on. No keepers but fun for the first day and loads of other fish in fact we ended up with 18 species and shark over 100 lb just on this wreck. 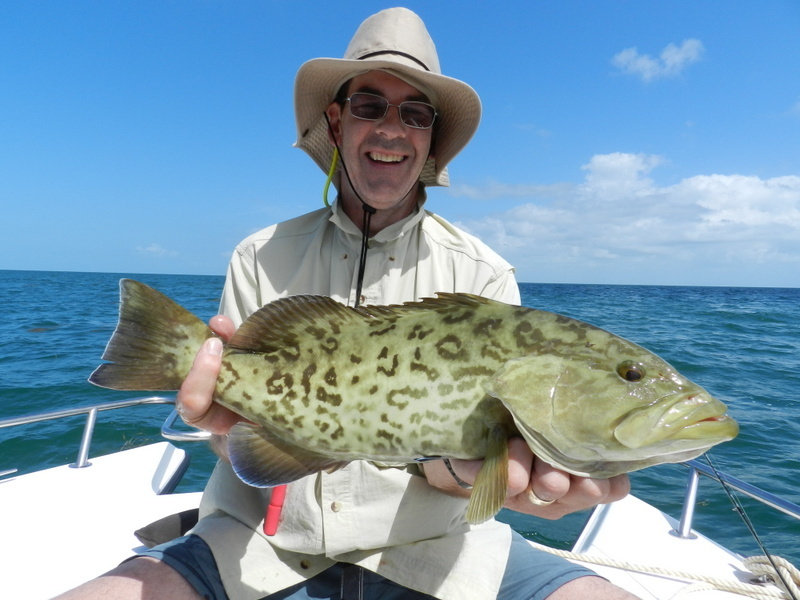 We are in the last few weeks of the grouper ban yes its been tough but what a difference fish numbers are amazing looks like the guys have got it right. 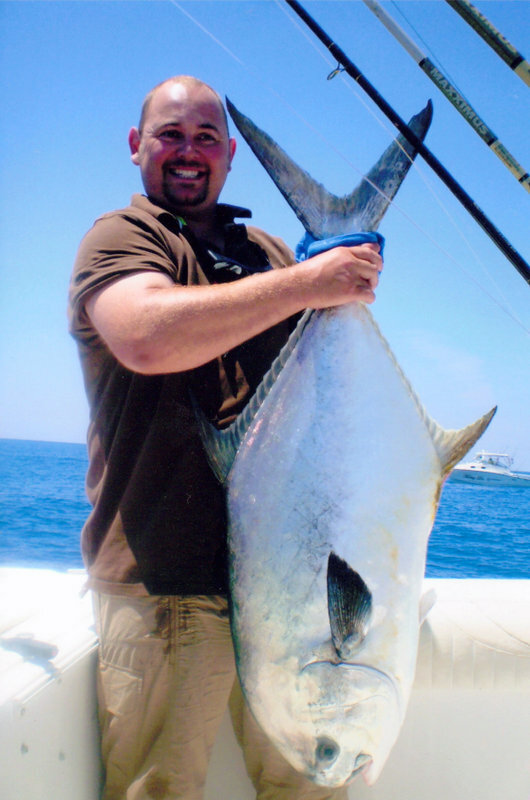 We are so lucky in Florida years ago they went down the tight controls and the sport fish route and boy does it show. As they say you can eat a fish once but catch it 20 times and someone even worked out each bonefish was worth over 30 k to the economy in its life as a sport fish, you know it makes sense. On the trail of those 100 lb herring tomorrow will let you know keep watching !!!!!! 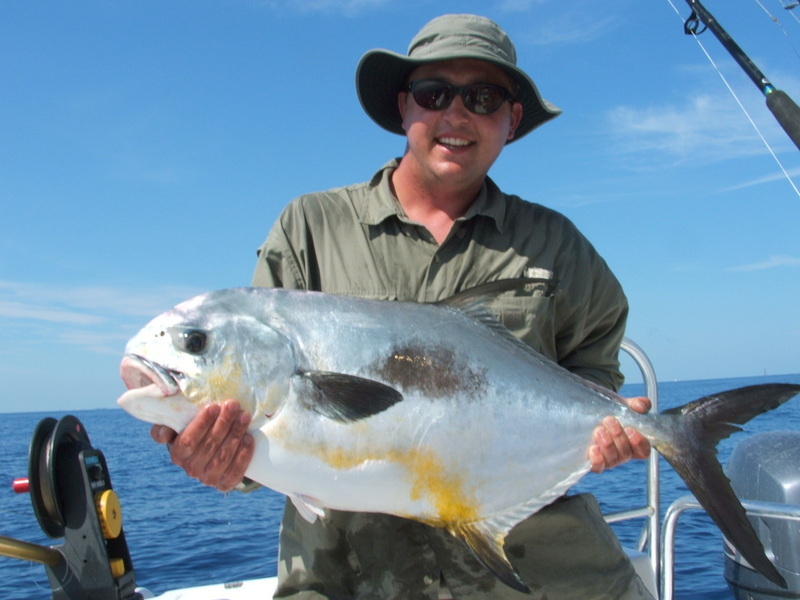 I suppose the number two fish on most people’s wish list on fishing holidays with us after a 100 lb tarpon is a big permit. 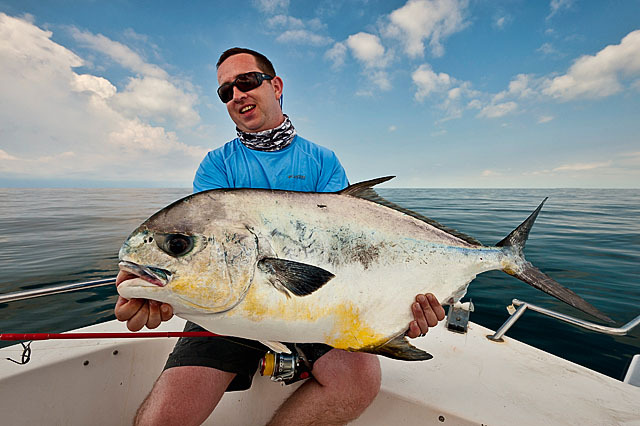 It is very hard to describe just how hard these fish fight and we have over the years been very lucky with big permit. Our best fish was in the high 40’s and believe it or not was the smallest fish in the group swimming by the boat that day. 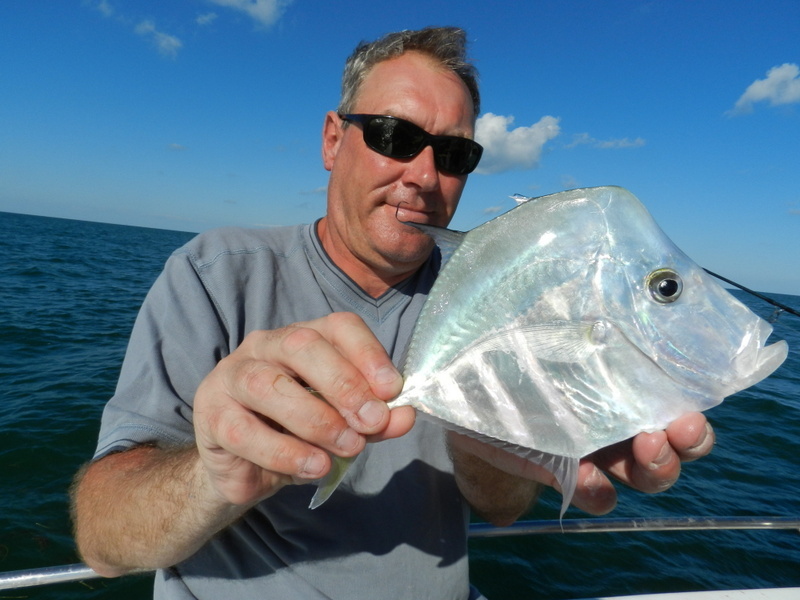 We target the very big ones on the spawning grounds some 8 miles offshore on a group of wrecks called the bridge rubble where part of the old 7 mile bridge was dumped when the new one was built. This wreckage is in about 100 ft and a mecca to spawning permit, also massive shark which all to often ruin a days permit fishing. What the fish do is build up a school of 300 to 500 fish then swim in a cone then the sexes go into the cone and spawn thus releasing millions of fertilized eggs all at one time into the entire water column. Even though the water is some 100 ft deep most fishing is sight casting to smaller groups of fish arriving and swimming round the spawning grounds. We use small swimming crabs and the take and first run just off the scale and the number of times the fish just goes straight back to the bottom amazing. Permit can grow to nearly 50 in and get to near 80 lbs growing very fast in the first 5 years and reaching maturity at 2 to 3 years at about 20 in. Last commercial records show over 10 metric tons harvested in Florida in 2002 now all stopped as they have much more value as a sport fish. Last year the regulation were tightened up and a new control zone was sett up just the top proactive fish management in the Florida Keys. Well its that time of year again when we all experience the pain and pleasure of good old Megalops Atlanticus or the silver king if you prefer. Actually I am back in the UK for a few days before the start of our tarpon season one of the reasons is at the moment I have no boat. 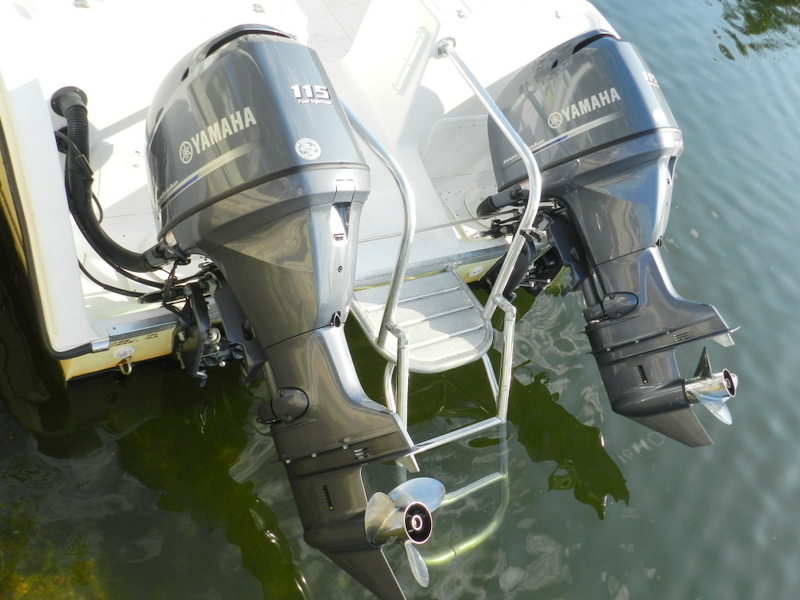 After 8 years and 3000 hrs of faithful service she is getting new engines.Yamaha have done a few changes to the 115 hp that I use and with the Miami boat shows deals and the offer of a full 5 years of warranty I took the re power deal. Back to tarpon in a quiet moment I have done a bit of research into my quarry and a few facts have even surprised me. These majestic and annoying fish have been around unchanged for 125 million years. They evolved to what they needed to be and have remained very successful at what they do as well as the engineers say if it is not broke don’t fix it. 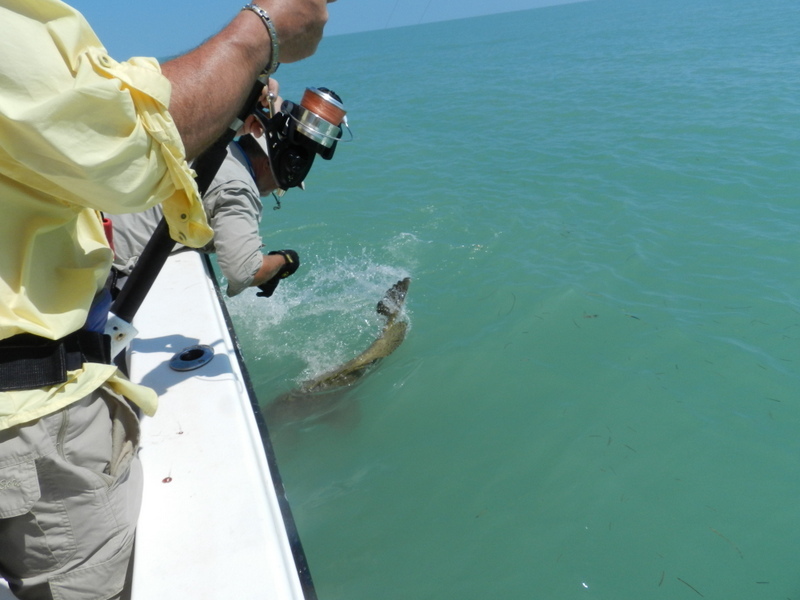 During our fishing holidays in the Florida Keys we have been very successful with tarpon having our first 200 lb fish last year. We now use the very accurate tables of length and girth to get weights to just a couple of pounds and this beauty came out to be 209 lbs. 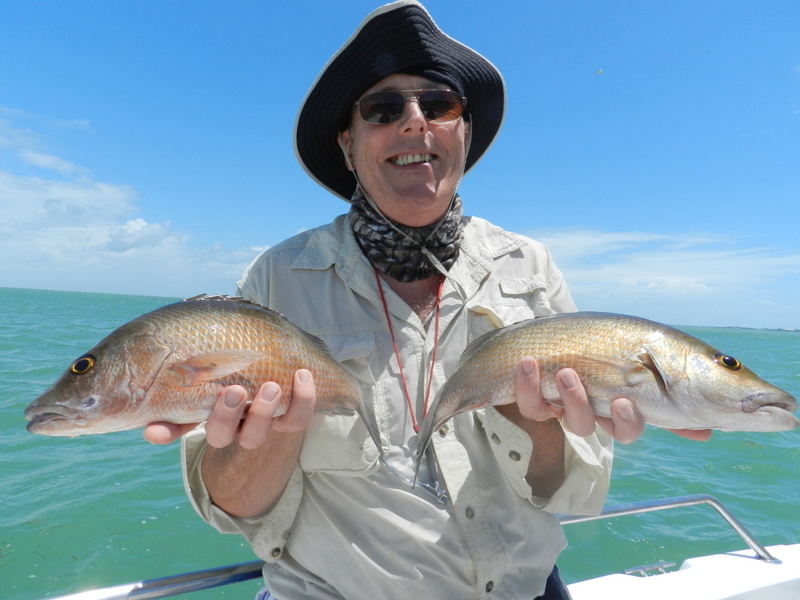 The middle picture is from the webcam at Bahia Honda, use the link on my home page, and is courtesy of Don DeMaria the others are happy and tired anglers on our fishing holidays. Back to tarpon facts they can grow to just under 300 lbs but grow very slowly a fish this size is probably well over 30 years old. They only reach maturity at 6 to 7 years old and a magic 100 lb fish is about 13 to 16 years old. The oldest fish know was on in captivity and was 63 years old when it died, many fish live well over 50 years in the wild. Spawning figures are also amazing with females having 12 to 15 millions eggs and they don’t spawn in one spot migrating and spawning at the same time. 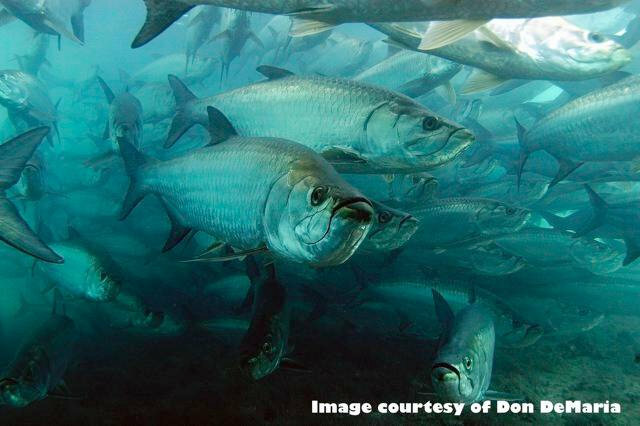 Tarpons best trick is their ability to take air in gulps and have developed the swim bladder as a type of lung, you will often see this during the later stages of the fight. Not long now to the madness of the tarpon fight, huge jumping fish, unstoppably runs, concrete bridge piles, chaos in the dark and last but not least 1000 lb shark biting your fish in half bring it ON. 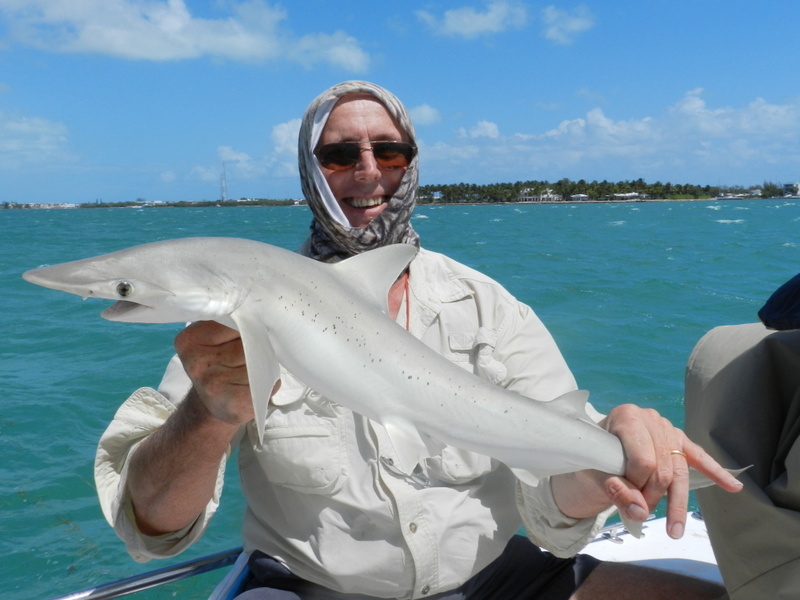 I have now been running fishing holidays in the Florida Keys for 8 years and we have always been very lucky with species. It still came as a shock when John told me that Derek had been keeping a diary of there last trip and in their 8 day stay they ended up with 68 yes 68 different species a new base record. We did catch a lot of weird and wonderful ones and had a day offshore, lizard fish, lookdowns,houndfish just to name a few but 68 wow ! This to me is the beauty of the Florida Keys a huge variety of fishing locations is a relatively small area deep offshore, reefs. bridge channels, flats and mangroves. 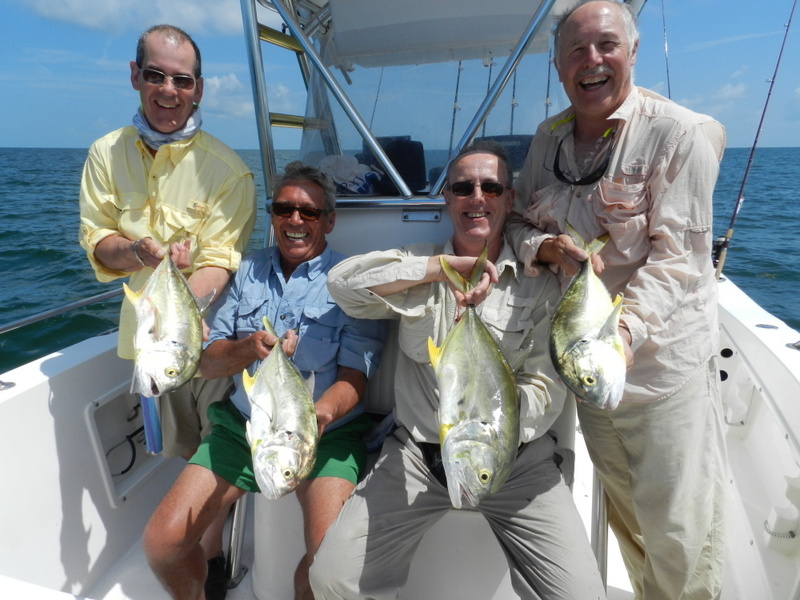 Fish the dream has the boat to do it all and with the fishing holiday controlled buy the guests we can do it all. 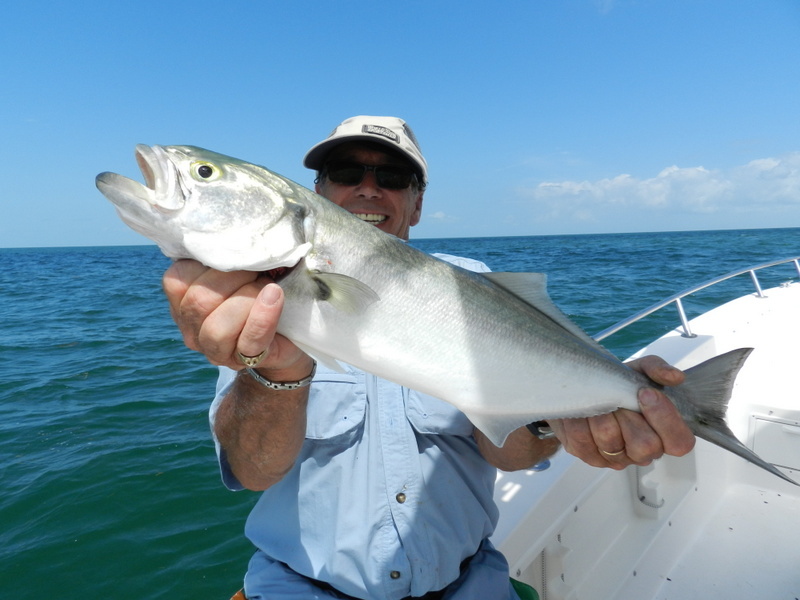 The other plus side of the Florida Keys is the control of the fish for sport fishing, bag limits, size limits, slot size and closed seasons. All the regs are no brainers 2 fish is 2 fish, 12 in is 12 in and you will be done no court case just an instant fine. The men in the very fast boats with flashing blue lights appear from nowhere and have probably been watching you for some time. 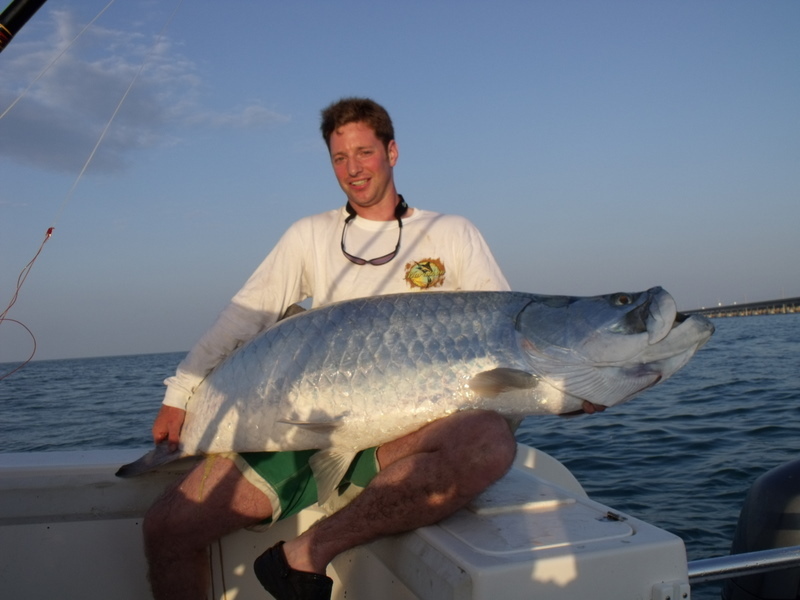 As the ad said if a beer company did sport fishing it would probably be the the Florida Keys and long may it continue. The two photos are John with a strange hogfish and the very silver one is a lookdown they don’t come any more silver. 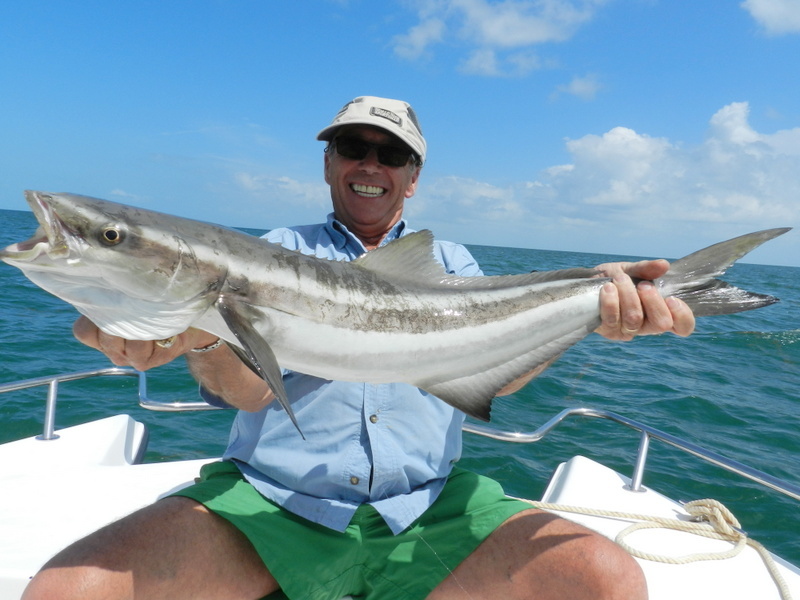 After running fishing holidays in the Florida Keys now for over 8 years I still get a big kick when one of the anglers says he has just had his best days fishing ever. On the last day John’s party was very keen to book for next year and paid the deposit on next years fishing holiday before they even left. I still like to get feed back and with over 80 % repeat bookings I think we must be getting it nearly right, maybe its the boat just as happy in rough seas 30 miles offshore or in 12 in of water chasing fish on the flats or letting the anglers decide at breakfast what we are going to do. What ever it is it seems to be working and long may it continue, back to Johns last day. Not quite the start we had planed but a huge permit a good start in anyone’s books then the plan was the grouper wreck so north some 20 miles we went. From nowhere the seas turned nasty not good for dragging 300 lb fish out of the wreck so off to find shelter on some banks. This is the real beauty of the Florida Keys we can fish in any weather and normaly find fish well after a few banks we found some huge cero mackerel to nearly 10 lbs. Hard to catch but they can not say no to a live ballyhoo just watching them circle before the kill is amazing. Well as normal if you find the macs the shark are not very far behind and after a couple of nurse shark a drag screamed then a shark jumped. 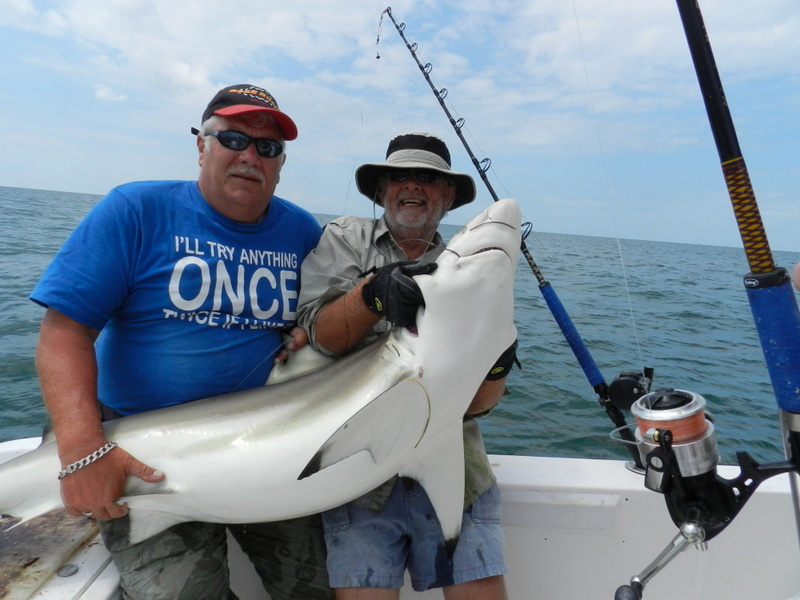 A very big blacktip and this one was not for stopping first run nearly 300 yds Ian looked a bit worried but I like to stack the shark rods and assured him there was 300 yds of 50 lb under the 80 lb line. Well it all ended well and a near 100 lb fish had a few pics taken before dehooking and sent back to chase more mackerel. Yes I know it looks mad but I was shown how to do this many years ago and the shark just goes to sleep not as bad as it looks. Well what a fishing holiday and what a nice bunch of guys they just liked fishing and had a laugh no matter what the weather gods sent us, boxes ticked and more to be ticked on there next trip I can’t wait a FUN week. PS John had the last fish a well pissed of nurse about 200 lb showing us all they can fight.